International Extreme Walking Marathon Kierat (http://maratonkierat.pl/indexeng.html) is an event that has been on my mind for years. However, there were always adverse circumstances preventing me to go. Whether it was too short after another ultra I ran, or a family event taking place the same weekend, or too frequent travels to Poland to add the Kierat trip, or too expensive airfare to Cracov etc. This time, taking advantage of a 2-weeks’ leave in Poland I made a deal with my old ultra running buddy Michal that we’re going, got my wife’s consent for a 3-day lads trip and in February signed up for Kierat. Since then the excitement had been gradually mounting ahead of the race day! The literal translation of kierat from Polish to English is horse mill (https://en.wikipedia.org/wiki/Horse_mill). The use of this word also implies that someone performs a tough, gruelling and seeming endless work, which gives you a good taste of what this race is about. Kierat takes place in Polish mountains called Beskid Wyspowy (loosely translated as Island Beskids) which results in way more vertical gains, comparing with a relatively flat Harpagan. At 6 AM on Friday, May 26th I picked Michal up and we set off. The drive from Gdansk in the north of Poland to Slopnice in the south took us just 6.5 hours, which is an amazing improvement from what it would have taken a few years ago. The improvement is of course due to a much better road network, including hundreds of kilometres of new motorways. We registered for the race, picked up our race packs and went for a meal to a nearby restaurant. With a few hours remaining until the start, we laid down in the school gym, which was the designated sleeping area in the base, to relax after the drive and then get ready for the race. My base and race equipment- quite a lot of stuff! One hour before the race start we were ready; we walked to the nearby football pitch where the race would start. There at 17:30 the race planner wished everyone good fun and good luck. A few minutes before 18:00 660 people were ready to set off. Before I jump to my report I’d like to recommend the winner’s report: http://maratonkierat.pl/kierat14/kierat17kl.htm (only in Polish, but Google Translate can help). I like the format of his report which I’ve decided to use in my report too. Aside from that you could see what an amazing event he ran. Still out of my league, but working on it. Moreover, the purple line denotes the optimal race route, as shown by the race planner after the event. Above is the recording from the start. You can see me in the middle of the shot between seconds 22 and 25. At 18:00 we set off and quickly the 660 people split between runners and walkers. Michal and I initially jogged with roughly 100 people ahead of us. After the LOP (a compulsory stretch where no other routes were allowed) we turned to walking, as the uphill started. It was a beautiful and sunny day, so I very soon heated up and started sweating profusely, particularly on uphills. Other than that, CP 1 reached without any problems. After the arduous climb towards the top of Mogielica (which can be clearly seen as a lot of red colour on my GPS track) we missed a path and then had to traverse the mountain through a forest. To get to the road marked as white on the map turned out to be a little nightmare, because the path we were following suddenly disappeared in a dense forest on a steep slope. After a taxing and precarious descent, we reached a forest road that in turn led us to main road which led us easily and quickly to CP2. Navigation on this stretch was easy, because we pretty much had to follow marked tourist trails. We had the opportunity to enjoy some beautiful sights and a stunning sunset. When passing Jasien there was a brief shower and it suddenly got dark so that we had to turn our headtorches on. The refreshing shower passed soon and at 21:09 we uneventfully reached CP3. This was the second longest stretch at Kierat, also there were a couple of not obvious places where good navigation was crucial. From CP3 we quickly descended to the road. On the way, similarly to the winner, we had an encounter with a couple of cows that were roaming free on the path… fortunately these were just two calves that quickly ran away. Between Road 968 and village Konina we got a bit lost and had to plod through tall grasses and a couple of ravines until we reached a nice road that took us to Koniny. From there the navigation was easy, though we didn’t go for the route proposed as optimal, because, according to the map, there wasn’t supposed to be any road there. 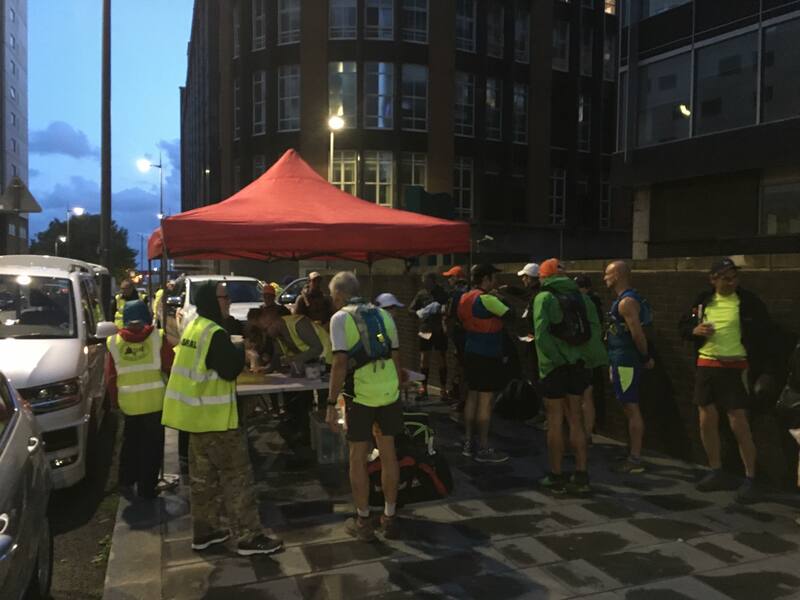 We checked in at CP4 at 23:06. This meant we covered 29k (18 miles) in just over 5 hours. My Garmin watch showed we actually covered 30.74k (19-ish miles); so far a very reasonable overhead. The checkpoint crew informed us that we were around 70th place. At the CP we refilled our water supplies and set off. This was supposed to be an obvious and quick descent to Koninki. Instead by taking a wrong turn we went too much south and had to slog through grasses and brambles until we made it to the road. This cost us a few precious minutes. After that we made it to the wearying ascent upon Gron. Just before another hill called Ostra I could have gone almost straight onto the CP. Instead I ran too much north-west and descended too low. As a consequence, had to laboriously go up to get to the CP. This small error cost me 10-15 minutes, so I was in a vile mood. We made it to Jasionow after an initial run followed by a slog along a ravine. From there followed a nice stretch of running followed by a long and toilsome ascent along the yellow tourist trail towards the Stare Wierchy tourist shelter. From there followed a downhill towards a valley, which we took slowly due to the path being muddy and stony in places, plus we were already quite tired. In the valley, we entertained a short run followed by a fast-paced walk on a slight uphill straight to CP6. There was a great surprise- the organisers provided grilled sausages! We took a longer than usual break to each devour a ketchup splattered sausage- yummy! A key stretch, because it led to the halfway point with hot soups! The first couple of miles we briskly walked along a stream, until the road/path disappeared and we had to wade through the stream itself. Jumping from one stone to another and getting our feet frequently into the cold and refreshing water was actually not too bad. It was a picturesque route, which I’d love to cover on a hot and sunny day, as opposed to doing it in the middle of the night having covered 25 miles already. After a while we left the stream and enjoyed an arduous climb towards the ridge, up where we could pick up the pace again. Once we found the blue trail which was supposed to lead us straight to the checkpoint I got a motivational kick and set off running most of this bit. Meanwhile night turned into dawn and at 4:39 we clocked our SI cards at CP7. CP7 was located at 55k (34-ish miles) so more than halfway through. It took us 10.5 hours to reach it, so my target of 24 hours looked easily doable; the 20-hour target seemed a bit of a stretch considering that the second part of Kierat involved more challenging navigation. My Garmin showed we covered 58k (36-ish miles) so still a very decent overhead. The CP crew informed us there were about 50 people or so ahead of us so far, so we made great progress since CP4, despite the navigational errors. At the checkpoint, I refilled my water bottles, drank one soup and one cup of tea and we were gone. A relatively short stretch: firstly, a laborious climb up Chorobowska (200 metres or so up) and then a bit of a puzzle how to proceed- either a long way around or risk a forest path that was not on the map. I chose the latter which turned out to be a very good decision because it led us to the checkpoint. There it turned out we moved up by almost 10 places! Also, there was another surprise: we could grab a bread roll with cheese which served as a great replenishment of calories and nicely broke the sweet taste of gels and bars. Navigationally quite an easy stretch: firstly, an ascent to Przelecz Knurowska (Knurowska Pass), then a fast descent to the village and then another laborious ascent. We easily found CP9 sitting at an edge of a glade. The worst stretch of all! After a relatively slow descent down a sodden and stony path I chose an evidently bad route. In hindsight, I see that the optimal route or the winner’s route were much better than mine was. After a gruelling climb up Skalisty Gronik, influenced by some other competitor we cut it straight towards Jamne through brambly forests and sodden glades. This was exhausting, to put it mildly. Once in Jamne we took a forest path uphill which soon disappeared on a steep, wooded slope. Moving laboriously up at a snail’s pace I was hoping we’ll soon reach a walkable path, but we kept on and on. I was seriously pissed off at that point and fed up with the whole thing. Michal was a witness to my dirty expletives aimed at the hills, trees, branches, stones and other inanimate objects, which didn’t seem to care at all about my predicament. Eventually we reached a forest road which easily led us to the green trail, from which we sought to descend a ravine where the CP was supposed to be. After an exhausting descent, we made it to CP10. It took us 2 hours and 42 minutes to cover a 5-mile stretch! We certainly dropped from our good place from the previous CPs. Still fuming, tired and annoyed with chafed heels, rather than have a bit of a rest and take stock of my situation, I set off on another arduous climb in order to find a path traversing Strzelowskie. To add to my misery, it turned out that while battling with branches and brambles I lost one of my two Salomon Softflasks. Aside from the fact that they’re quite an expensive piece of an equipment it meant that I was left with frighteningly little water for this long stretch. Michal and the surrounding trees were a witness to another set of obscenities from my mouth. After the laborious slog, we finally found the path. However, after a few minutes I decided I need to stop, sit down, and repair my feet. I told Michal to proceed and that I’ll catch up with him. I sat on grass, took off my wet shoes and sodden socks and cleaned my dirty feet a bit. Then I put a couple of plasters on chafed areas and taped them up with a well-adhering kinesiology tape. Fortunately, I had no blisters. I put on a fresh set of socks, the shoes and … I felt reborn! The whole stop lasted maybe 5-7 minutes and it worked magic. I again felt strong and could run on legs which felt amazingly fresh. As could be seen from my track I significantly picked up my pace along Strzelowskie. After a few minutes, I caught up with Michal and left him behind without stopping, assuming he won’t be able to maintain my pace and will easily finish on his own, just as we usually do. Before the final descent I of course had to make an error and had to make a beeline for the road on a very steep and forested downhill. This was followed by a fast run to Mlynne. From there another ascent and then a long but gradual descent to CP11 in Kamienica. On the last few miles I had to cautiously ration my water supplies, but fortunately made it. I checked in at CP11 at 12:06, so 82k (51.2 miles) took me 18 hours and 6 minutes. The real distance covered showed us 86.3k (54 miles). At the checkpoint I refilled my bottles, took another bottle as a replacement of my Softflask and set off. The easiest stretch where it was impossible to get lost. Easy, but not too fast due to a long ascent. The last long stretch; I chose a good route, as can be seen from my track. I even covered it relatively quickly with a mix of running and brisk walking. Between the two checkpoints I think I overtook 8 or so people, which was quite motivating to push ahead. 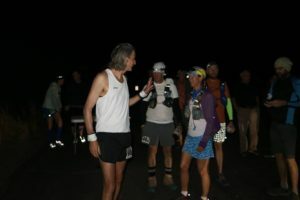 I arrived at the checkpoint at 14:25 (20 hours and 25 minutes underway) and got hopeful I’d finish below 21 hours. It was supposed to be easy and quick: take the obvious path to the road and then follow the road till the finish line. Somehow I followed another path which abruptly ended and I had to follow a beeline course for the road through a glade which was a bit slow going. Just before the road I had to fight my way through a mix of dense nettles and brambles which unmercifully stung and scratched my lower legs. 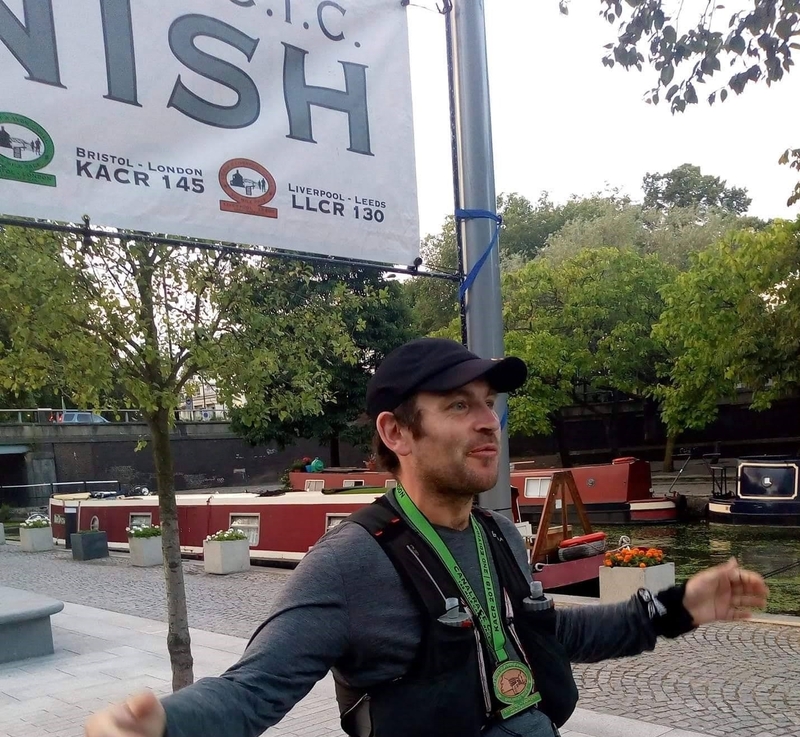 I ran almost continuously along the road, but a few minutes lost in the nettles resulted in not making it across the finish line under 21 hours; I finished at 15:02. I completed Kierat in 21 hours and 2 minutes. According to my Garmin watch I covered 104.83k (65.5 miles) and 4540 of altitude gain. It’s a result I’m happy about, considering getting lost a few times and choosing a couple of sub-optimal routes. With this result I took a high 37th place, which is much better than I had anticipated. After my crisis around CP10 I spend a few minutes taking care of my feet which resulted in consecutive gain of around 20 places. Michal finished at 16:30, so just under 1.5 hour after me, taking the 51st place. In total, 660 competitors started, and 263 finished within the 30-hour time limit. Afterwards I felt quite well. Besides chafed heels and scratched lower legs I didn’t have any blisters which is a significant improvement from my recent races. What’s even greater, a few days after Kierat I had no muscle soreness which is a testament to how well my body handled the event (or a proof that I didn’t push hard enough!). One week after Kierat I ran a sub 2-hour training half-marathon, so I’m ready for the next challenge. Overall, my impressions from Kierat are great. It’s a well and professionally organised event, where one can clearly see how much effort the organisers put to make sure all works fine and everyone is happy. Combined with the beautiful scenery of the polish mountains of Beskid Wyspowy and Gorce, it’s now one of my top races where I’d love to run again in the future.